You should always unplug an appliance before making any repairs. Replacing your solenoid will involve disassembling the ice maker and unplugging wires, so unplug your refrigerator first. 2. Access the shelf with the ice dispenser motor. Open the freezer door and remove the ice bin by lifting up and sliding out. Next, remove the two screws that attach the ice maker to the ceiling of the freezer section. Then wiggle the top edge down to free the two tabs. Set it down on the top shelf at an angle. Now you can see the wires at the rear of the ice maker. Unplug the red wire by pressing in the locking tab on the wire harness. Now the ice machine is completely separate and you can set it aside. Remove the plastic white divider that’s to the right of the ice maker by removing Phillips screw in the front right corner. After that, remove the top shelf that lives under the ice machine. To do so, unscrew the two Philips screws at the front corners under the shelf. Then pop the shelf up and free of the tabs holding it in place. Carefully pull it slightly forward and set it on a lower shelf at an angle. The motor on the rear left corner will be heavy. Unplug the wire harness in the back left corner by freeing the locking tab of the harness with all the wires so you can remove the shelf completely. Set the shelf on a covered work surface. The solenoid lives in this part, so the remainder of the repair will take place in this part. 3. Remove the ice dispenser solenoid. First, orient the shelf so the box is on top. Use a flathead screwdriver to pry it open by unlocking the two tabs remove the back cover. Look inside and loosen the screw holding the green grounding wire. Next, return to the top of the part and remove the two screws sitting next to each other on the taller portion of the box. This will release the solenoid on the inside. Pull it out of the box and then unplug the white two-pronged wire harness. Also, reach inside the box to remove the white plastic yoke. It slides into the guides below where the solenoid is housed. 4. Prepare the new ice dispenser solenoid. Remove the foam insulation from the old solenoid for reuse. Also, peel away the rubber pad from the opposite side. Stick it to the bottom of the new solenoid. Then place or glue the foam square over the side with the circular cutout. Secure the yoke assembly in a vice grip tool. Orient the part so the white plastic tabs are safely outside of the vice and won’t get damaged. Once it’s secure, use a punch hammer and a pair of pliers to remove the pin on the center part that holds the metal tube, or plunger, inside the yoke. The yoke and the pin will be reused. Slide the new metal plunger into the old plastic yoke. Orient the hole in the yoke with the hole in the plunger. Then drive the metal pin into the aligned holes. Carefully hammer it in so the pin edges are flush with the edges of the yoke. Now the parts are ready to be installed in your refrigerator. 5. Install the solenoid and yoke back into the assembly. Slide the yoke into the guides at the rear of the shelf’s box. The extending plastic pins on either side will fit down in the guide so the yoke can rotate but not fall out. Next, install the solenoid. Plug in the two-pronged wire harness and slide the yoke’s plunger into the circular hole of the solenoid. At this point, the solenoid should be oriented with the circular hole facing downwards and with the wire harness on the right side. Hold the solenoid in place against the back panel of the box. While you’re still holding it in place, reach around to the exterior of the box and secure the solenoid with the two washers and screws you removed earlier. Attach the green grounding wire back to the front-facing side of the solenoid. Reattach the cover. First, orient it so the cover matches the edges of the box. Pull the gray foam insulation around the wires into the circular cutout. This stops the wires from getting cut by the plastic edges of the cutout. Also, make sure the wires are pushed inside the box so they don’t get pinched. Then snap the cover into place and listen to make sure the four tabs click shut. Lay the shelf on the top shelf in the freezer section of the refrigerator. Plug in the white wire harness that holds all of the wires. After that, slide the shelf back onto the rail and make sure it’s level. Press the back firmly into place and reattach the two screws in the front corners. Slide the divider into place on the rails and secure it with the screw in the front right corner. 7. Reassemble the ice maker. Pick up the ice maker from where you set it aside and orient it so the wires are at the rear. Lean it above the top shelf and plug in the white harness in the socket in the ceiling cutout. Next, make sure the rear of the ice maker aligns with the two interlocking brackets in the back. Then push it into place and make sure the front two tabs click into place. Secure it in place with the screws in the front lip of the ice mark. Slide the ice bin back onto the rails. Push it into place until you hear it click and you can’t easily slide the bin out.Plug the refrigerator back in and test to make sure both ice options are available. 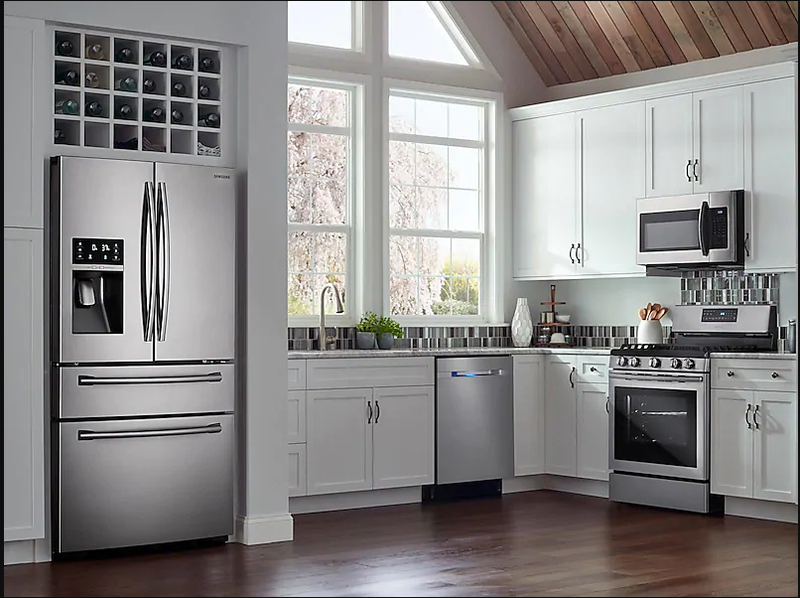 Go to Appliance Express for more tips and repair procedures. Our technicians can also help repair appliances with tricky malfunctions.